Upon publishing this review, I received word from Fence Books (the publisher) that eteam (the authors) had withdrawn their novel, OS Grabeland, at the last minute from publication, due to what Fence told me was something akin to “irreconcilable differences.” This is unfortunate as such a singular work seemed to me a good fit for Fence, whose prose output, atop their usually outstanding work as a poetry press, generally bends toward the enigmatic and various. Hence, an “art novel” by an equally enigmatic and various set of artists, eteam. That said! This leaves my review of OS Grabeland (which I assume will eventually be published elsewhere, if not in the exact form I perused it in) in a similarly enigmatic liminal space. One, I should say, now that the circumstance presents itself, that I’m not uninterested in. Beyond the machinations of publicity or any belts of commerce, what is the role of a review? Is its purpose merely supplemental, its position auxiliary, its eye elsewhere? Must its text, grail to which it subtends, be legible, or even available? I’m reminded here of Lisa Robertson’s sense of the commodious codex: “By commodious I mean: This object furnishes hospitable conditions for entering and tarrying; it shelters without fastening; it conditions without determining.” A text is archeological and unrecoverable; an ocean has infinite shores. It’s just not often we are left oceanless on one of those shores. It’s a position of traced duration and temporal flux reminiscent of Robert Smithson’s site/non-site dialectic, which I use in the review to frame my thinking about OS Grabeland, and now, perhaps even more fittingly, to think about OS Grabeland’s absence. So what is a review without a text? Or with only traces of one? Once more, Lisa Robertson: “The tectonics of the book frame chance and its twisting trajectories, not an origin. A reader is a beginner.” And so too a reviewer. Maybe eteam are some sort of Internet-deranged disciples of land artist Robert Smithson. I mean, the Internet simultaneously reifies and implodes the bounds of Smithson’s foundational site/non-site dialectic — open and closed, scattered and contained, reflection and mirror, physical and abstract. So, what are the fundamental dialectics of the Internet? In 1970 Smithson visited, secured a lease, hired a local construction company, and built his “Spiral Jetty” in the Great Salt Lake to explore the durational magnitude and entropic flux of his site/non-site dialectic. Today, eteam gets on eBay, buys cheap property at random, and interacts with the earth-site to explore the tenuous bounds of web-site. Eteam “traffic[s] in transience” as they put it, and the results of their projects are deeply bizarre, fluctuant, and hilarious. What if we bought a ten-acre plot in Nevada sight unseen and, knowing nothing of airports or construction, attempted to build an international airport, along with its faux-website, in the middle of it? What if we bought huge tracts of land in Second Life, an interactive online 3D virtual world, to use as a massive public dumpster? Or, in the case of their debut novel OS Grabeland, winner of the 2015 Fence Modern Prize in Prose, what if we bought the cheapest piece of property in Europe on eBay and attempted to inhabit, or visit, or just create some sort of “art” with it? Eteam is an art duo consisting of the German-Americans Franziska Lamprecht and Hajoe Moderegger. They create relationally unstable, highly situational art that operates at the intersection of land art, conceptual aesthetics, social practice, and a hyper-saturated use of the Internet as 21st century détournement. Every work operates across various mediums, from rampant photo and video documentation to bizarre Situationist stagings, from blogging and creating Fluxus-like websites to multimedia gallery installations. It’s hard to separate these projects from each other because of this generative (and sometimes degenerative) mess of forms. They are very gaudy, messy conceptual artists collapsing what boundaries, if any, anymore, there are between solid earth and groundless web. 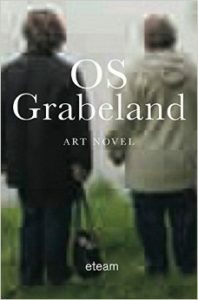 OS Grabeland, an “art novel,” begins on the Internet. A fairly banal scene of eteam sitting in front of a computer screen buying land. “That the land turned out to be in Germany, the country we had grown up in, was as much a coincidence as the fact that this particular piece of land came with people.” In pure Situationist form, prizing coincidence over intention, these two chance facts become crucial to the novel’s — how shall we say — meandering arc. Now landlords in a place they’d never heard of for residents who’d lived there their entire lives, the book, in many ways, evolves toward an exploration not only of Germanness but of persona and place, of the porousness of both and their fungible yet primary relation. To that end, the book wedges itself in the oddest, right-shoe-on-the-wrong-foot landlord-tenant relationship I’ve ever come across. There’s eteam, the detached, bizarre, ex-pat, conceptual artists who know nothing about and care only abstractly for the land (and tenancies) they’ve bought; and then there’s the miserly, intractable, postwar rural bumpkins who’ve lived on this property for decades suffering through many landlords, from harsh Soviet caretakers to contemptible post-Soviet schemers, and now totally inexplicable, and mostly absent, German artists from America. Much of the novel’s pathos and humor boils down to the peculiarities of this dynamic, its attendant miscommunications, suspicions, and moments of clarity. On the other hand, this relationship — owner/tenant, subject/object, narrator/character, urban/rural — prefigures what lingers as an unsettling and, however conscious or complex, not-quite-resolved ethic of power throughout OS Grabeland. In general, land art principally operates under the pretense of an a-human, or pre-human, sphere. Eteam’s divergent but conceptually analogous work — whether as unwitting landlords or, in other projects, eccentric interactive neighbors — often treats people, however, as the very land in land art, as an abstractable ground for art-making. This is an ethical quandary all social practice and situational art on some level, messy as it can be, has to deal with. Otherwise it can become all too swiftly troublesome in its reaffirmation of eternal, and eternally predictable, problems in art: artist as wielder of capital, artist as lone agent, artist as urban sophisticate — all of which obviously connect to larger systems of power and oppression, and which preclude, or at least impede, the subjectivity of those the art is working with. Eteam does a lot to confront these dynamics (the least of these efforts being the very “novelization” or fictionalization of themselves as objects in their project), but OS Grabeland, perhaps even purposefully, nonetheless rests on what feels like a slippery ethical slope. But what about Dewitz? Was this place removing itself from the map as if from natural causes? Were there no successors, nobody to replace the infertility of this agedness? Was the site less and less frequented because the information it stored was less and less valuable? Was there no knowledge that needed to be passed on? Was that the reason why the resolution of the satellite images was so low, and why there was no Internet connection and no cell phone signal? Everything in Dewitz was familiar, yet we felt surrounded by nothing but incomprehensibility. The world had abandoned us; we had cast ourselves out far beyond the limits of knowing what to do, we weren’t even sure what year it was, what century. We blamed the Internet. We blamed each other, the stoic, stifling, unspontaneous Germanness in us. Nothing is more hindering than being a German among other Germans in a country like Germany, we said. In every German sits a slave and everything in this country is a burden. Every German activity means obeying, hence it is accompanied by a groan. Eteam has a real fondness for this kind of prompt abstract riffing, and a seeming lack of care when tending to character development or plot. Subtitled an “art novel,” the writing comes across as travelogue, treatise, autobiography, historical memoir, diary, and even slideshow before it comes across as fiction. Though I would never describe the writing itself as lush or without its stylistic hiccups, OS Grabeland is compelling for its intrepid obsessiveness with the strange technicalities and unforeseen pathways of its project. As their conceptual art background (and perhaps their Germanness) would have it, eteam is tremendously fond of lists and accounting and unafraid of a certain self-destructive tedium, and so some of their most distilled prosaic passages call to mind the great mundane procedural passages from the novels of Thomas Bernhard and from Beckett’s anti-novels like Molloy and Malone Dies. Of the more “novelistic” artifices they employ, the one that stands out — an oft-encountered shift in narrator and perspective, to one of the many curmudgeonly, morbid residents of Dewitz, signaled by a sudden, jumbled shrinking of line spacing — does so for its haphazardness. OS Grabeland also includes a glut of illustrative photographs, images, and maps throughout the text. This is reminiscent in some ways of W.G. Sebald, also German, also pressing against the stifling burden of that Germanness, also obsessed with a certain excavation of history and its relation to place and persona. Whereas Sebald’s photographs in Austerlitz, however, are often oblique and haunting and few and far between, eteam, in the age of the selfie and infinite storage, uses a rampant excess of rather insignificant photos to chronicle the circumstances of their generally uneventful visits to Dewitz. A stork on a pole here, an overgrown yard with shed there. A close-up of a snail. Weeds. Gray sky. The back of someone’s head. Most of these images are tremendously humorous in their affectless obsessiveness, a maniacal levity that seems to be eteam’s guiding spirit. The novel’s elusive form, and formal playfulness, does some of the work I mentioned of confronting, or at least complicating, the ethical problems their project presents at the outset. By never allowing their subject and object to clearly cement themselves in typical genre-encoded positions of power, eteam on the one hand are the owners and artists subjecting others to the abstract fancy of their whims, and on the other implicate the art-making subject as the actual object being abstracted, controlled, and reworked through the process. There is no illusion on a basic level who wrote OS Grabeland, but there is a growing question throughout who is most reliably narrating and guiding it, and in that shifting control perhaps lies some attempt to stifle the discomfiting power of landlord artists with a conceptual agenda. In the passages narrated by the residents (or resident, it’s unclear to me if it’s many residents or just a single one) eteam is generally castigated and ridiculed for the abstract pointlessness of their project. The residents lampoon them behind their back for their inability to tend a garden or speak in basic ways to their heritage, and question their merits (Americans, nay, New Yorkers wealthy or well-funded enough to buy property and do ridiculous things with it) as artists. One could see this as cute self-deprecation and just more 21st century ironic reflexivity on the part of eteam; or one could see it as an earnest attempt to goad and destabilize the problematic relations on which so much conceptual and situational art relies. Honestly, it’s probably both. The ease of distinction, as with much in OS Grabeland, slips. We tried to document and record the transformation the land was undergoing from being a place with fixed coordinates to becoming a location-independent platform. The more we recorded, though, the less clear we were about what exactly we tried to capture; and at times it looked as if the recording devices were pointing toward nothing but the unattainability of our project. That unattainability is the art eteam came looking for, and, oddly, the only way for eteam and the residents to commune and connect. It is a fitting conclusion to a novel that’s fiction is uncertainly fictional, an art that’s project is hardly discernible, and a book that’s obsessiveness rampantly outpaces any particular object of obsession. Jacob Kahn is a poet originally from the Rocky Mountains. He currently lives in Oakland and teaches at an elementary school. A poetic guidebook, A Circuit of Yields: Conventional Wisdom for Giants (2015), is recently out from E.M. Wolfman Books in downtown Oakland. Other work can be found in MARY, Spork, and 580 Split, as well as an interview on the SF Weekly The Write Stuff blog.